Is Green Mountain Coffee Roasters Heading Toward A Brick Wall? - 24/7 Wall St.
Is Green Mountain Coffee Roasters Heading Toward A Brick Wall? Green Mountain Coffee Roasters (NASDAQ: GMCR) has delivered compounded annual earnings growth rate of 80% in the last three years. So why is the specialty beverage purveyor still cash poor? Green Mountain delivered another stellar cup of java to investors in May, with sales and operating income for its second quarter ended March 26 up 101% and 198% over the prior year to $647.7 million and $119.6 million, respectively. Yet robust operational metrics belie two troubling trends: growing debt load on the balance sheet and an inability to convert profits to sustainable growth in cash flows. The company produces and sells coffee makers and more than 250 varieties of specialty coffees, cocoa, teas and other beverages. In recent years, growth has been overwhelmingly driven by consumers’ enthusiastic adoption of the company’s patented Keurig’s K-cup brewing system, which lets people brew single-cup, gourmet coffee at home or at work in less than a minute without the hassle of grinding beans, measuring coffee, handling filters or cleaning up. Consumer research has consistently demonstrated people like the way their coffee tastes when brewed in a Keurig single-serve pod. Green Mountain manufactures and sells the top five gourmet single-cup brewing systems in the U.S., accounting for almost 25% of total coffeemaker unit sales for fourth-quarter 2010, according to The NPD Group. Unlike rivals, Keurig’s patented “injected brewing process” directs the coffee away from the center, producing a strong, flavorful cup of coffee. Organic growth is being driven by sales of namesake coffee K-cup portion packs and third-party licensed royalty sales ($0.064 on every single-serve K-cup sold), according to regulatory filings. In the second quarter, net K-cup sales totaled $411.8 million, up 94% (or $199.1 million) compared to the same period in 2010. 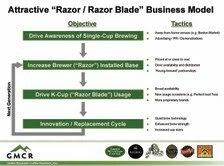 This “blades to Gillette” razors growth strategy has required the company to aggressively discount its single-cup brewer machines (slightly below cost) in order to rapidly build a sustainable user-base. An entry-level, one-cup coffee maker from Keurig — or a competitor like (Kraft-owned) Tassimo — is currently priced around $100; the cartridge for each cup is about 65 cents, according to Quick-cup Digest. In the second quarter, Green Mountain sold 1.2 million Keurig brewers, down from 1.4 million in first-quarter 2011. Expanding its roasted offerings and geographic footprint is proving to be capital intensive: In the last two years, the company spent almost $1.4 billion to acquire a distribution network, including the May purchase of California-based retailer Diedrich Coffee ($305 million) and the December 2010 acquisition of Canadian coffee roaster Van Houtte (for $908 million). Although most loan obligations don’t come due until 2015 and beyond, debt outstanding increased to $1.06 billion in March, up from $354.5 million last September. Corresponding quarterly interest expenses year-on-year have risen from about $900,000 to almost $16.8 million. As a result of recent acquisitions, intangibles (customer relationships and trademarks) and goodwill (excess of purchase price over valuation) now total $1.4 billion, or 52.4% of total assets, up from $606 million, or 44.2% last year. Of concern, Green Mountain might have over-paid to muscle-in on Canadian markets. Goodwill associated with the purchase of Van Houtte was some $472 million — flat coffee sales at the Montreal-based coffee roaster hint at the aroma of an asset write-down in coming quarters, in my opinion, depressing shareholder value. The company is scaling operations to stay ahead of brewer and K-cup demand. Capital expenditures in the first half of fiscal 2011 doubled to $99 million, due to start-up of new, higher- speed package lines in Tennessee, Vermont, Washington and Toronto. In total, management currently anticipates it will need to invest approximately $275.0 million to $305.0 million in new equipment and distribution channels to meet soaring demand for its K-cup portion packs during fiscal 2011. With Keurig single-cup coffee brewers in only about 7% to 9% of U.S. coffee drinking households, management and investors remain giddy on growth prospects: The share price of its common stock has soared more than 230% in the last year. Ergo, elevated financial leverage is viewed as a necessary evil. Given incessant need for growth capital, expect more debt to be issued and more red ink to flow. Trailing 12-month free cash flow was a negative $114 million. The company’s rapid growth has exposed disturbing internal weaknesses in financial accounting. In fact, every financial report issued by Green Mountain and certified by PricewaterhouseCoopers from 2007 to 2010 had to be restated because of accounting errors (such as, overstatements of income!). Well-known corporate gadfly (and the “reformed” convicted felon) Sam Antar is also calling into question current earnings performance and management credibility, believing recent quarterly earnings received an artificial boost from a reversal of sales return reserves. Notwithstanding legitimate transparency concerns, closer scrutiny of the company’s balance sheet also suggests cash flow isn’t the only metric conspicuously absent from alleged profitability gains: In the last six months, shareholder equity has soared 49.4% to $1.04 billion. Most of these gains, however, resulted from issuance of new stock — not from additions to retained earnings. In recent months, Green Mountain has thwarted potential competitive threats to its leadership position in the single-serve coffee business by signing retail distribution deals with nationally recognized brands like Dunkin Donuts and Starbucks (NASDAQ: SBUX), which signed a marketing deal in March to become the exclusive purveyor of super-premium coffees available for purchase in K-cup cartridges. As of last month, the few national brands that hadn’t partnered with Green Mountain included just Maxwell House, owned by Kraft Foods (NYSE: KFT), and Peet’s Coffee (NASDAQ: PEET). A deal with Maxwell House remains unlikely, given Kraft manufactures a rival, the aforementioned single-cup brewer system, called Tassimo. Green Mountain’s key retail partnerships could unravel next year, when two key patents (such as coffee filter design) for the K-cup expire. For example, Green Mountain’s agreement with Starbuck’s provides exclusivity as the “super-premium” brand for Keurig. But it still allows the Seattle-based java king to sign distribution single-cup deals with other competitors, such as the Flavia beverage system (manufactured by Mars), Sara Lee‘s (NYSE: SLE) Senseo system, or Nestle‘s Nespresso. Starbuck’s chief executive Howard Schultz has publicly opined in the past that his company would likely look to develop and sell its own single-cup brewer. Additionally, Stifel Nicolaus analyst Mark S. Astrachan cautioned investment banking client investors recently that new sales data suggests Green Mountain’s own branded coffees are losing single-serve share to J.M. Smucker’s (NYSE: SJM) Folgers. Astrachan presciently warned, too, that share losses could accelerate in coming quarters as beverage drinkers grow more familiar with K-cup offerings from Dunkin Donuts and Starbucks. 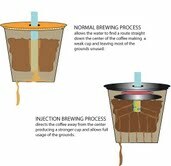 The increasing likelihood of direct competition to its Keurig-brewed technology and the incessant demand for more working capital — combined with an inability to successfully differentiate its own branded specialty coffees — suggest the only green this coffee roaster will see in its future is coffee beans — not profits. Written exclusively for 24/7 Wall St. by David Phillips. Phillips has more than 25 years’ experience on Wall Street, first as a financial consultant and then as an equity analyst for several investment banking firms. He sifts through SEC filings for his blog, the 10Q Detective, looking for financial statement soft spots, such as depreciation policies, warranty reserves and restructuring charges. He has been widely quoted in outlets such as BusinessWeek, CBS News, The International Herald Tribune, Investor’s Business Daily, Kiplinger’s Personal Finance, and The Wall Street Journal.